Cooking the perfect steak can actually be a tough challenge. It's often a guess to get the steak to the temperature you desire, and it's often overcooked or undercooked because you either get too conservative with the cooking time or cook it too long to ensure that it's cooked through. 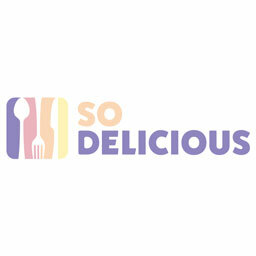 However, these guys may have just figured out the perfect hack to cook a juicy, medium-rare steak. And it doesn't require using a stovetop at all. YouTube comedians Rhett and Link attempted to cook steaks using different household appliances on their daily talk show "Good Mythical Morning." They experimented with an iron, a toaster, and even a dishwasher. The results of each experiment were pretty interesting, to say the least. Yea, I wouldn't be too down with that steak, either. Cooking the steak with an iron surprised me, as it actually looked extremely impressive. 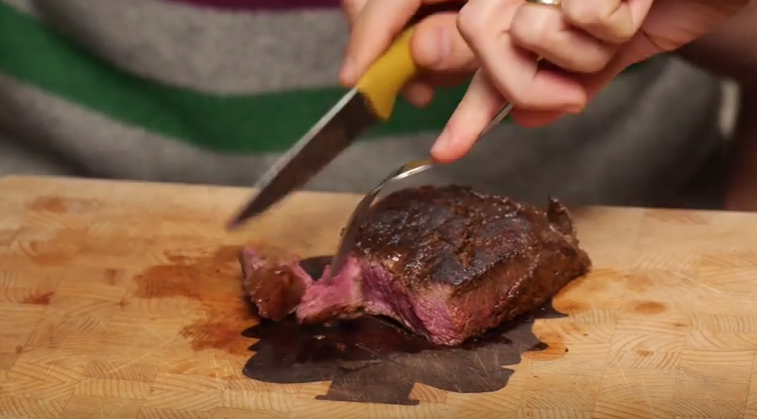 We've seen EpicMealTime use an iron to make a simple grilled cheese, but I never imagined that you could make a medium rare steak with an iron. Not only does it get an impressive char on the outside, but it cooks through in 13 minutes - about the same amount of time it would take for a similar steak to cook through on the stove. 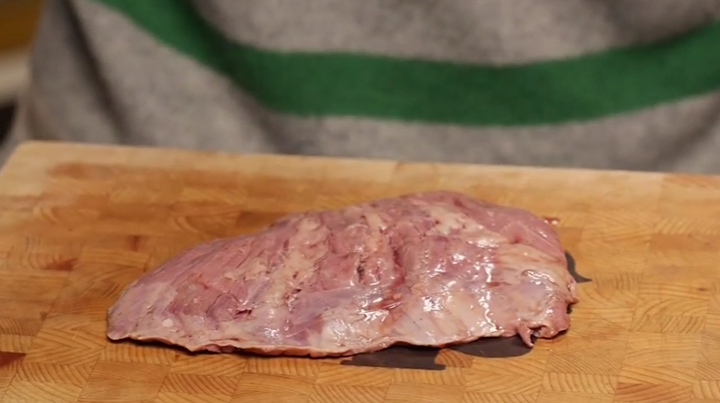 You can also use the spray/steam function of the iron to marinate and steam the meat, making it even more tender. 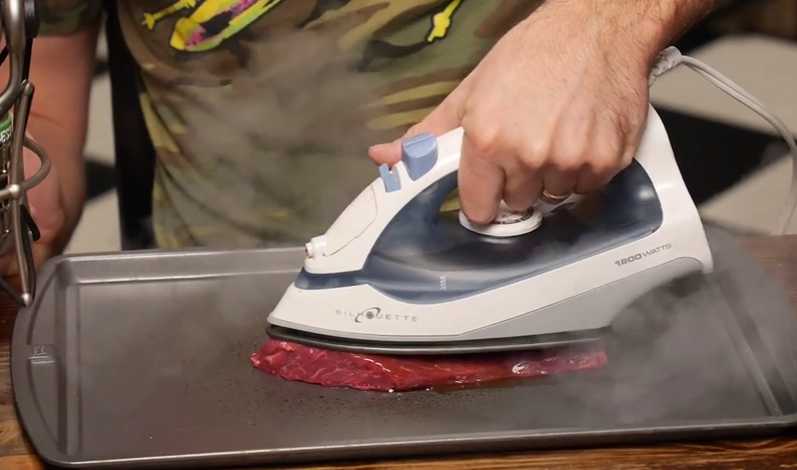 While Rhett and Link used two irons to halve the cooking time, simply turning the steak after six and a half minutes gets the job done if you don't have two irons on hand. This could be the ultimate hotel meal hack, since most hotel rooms have irons in them at the very least. If you don't want to go spend a ton of money at a restaurant while traveling, simply pick up a steak and cook it on your iron. I might try that the next time I'm on a trip just to see for myself. 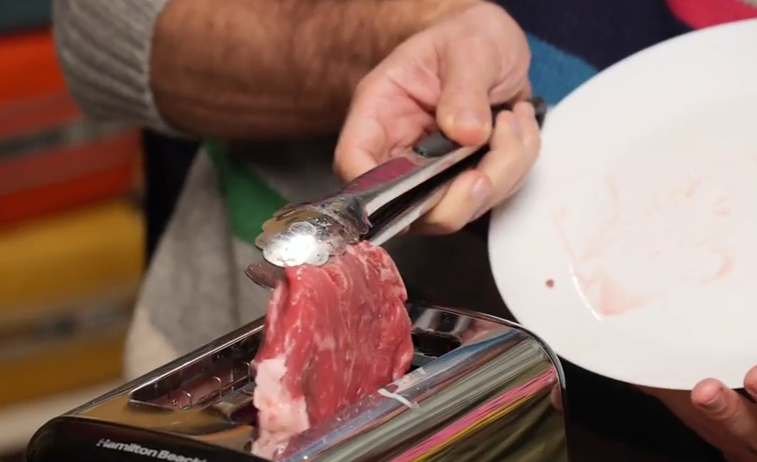 Rhett and Link also made New York Strips in a toaster, which sounds crazy. That's a high-quality piece of meat, and something like a toaster is usually meant for... well, bread. However, it is just high heat on a contact surface, meaning that you could get good color and temperature on the beef. The toaster-cooked steaks actually turned out extremely well, requiring just four cycles on high heat to get them to a medium rare. They got a nice color and looked pretty tasty. If you're looking to make steak quick, not have to worry about using a pan or grill, and want to get it to a specific temperature, maybe using an iron or toaster is the way to go. I'm definitely curious enough to give it a try after watching.